Most Indians I know prefer eating Dal Makhani when they are eating out, simply because it’s not something that you make everyday. Dal tadka on the other hand is made with toor dal which has to be the most common dal in Indian kitchens! Toor dal (or arhar dal) was made in my house everyday. So obviously when you go out, you don’t want to eat what you anyway eat everyday. But my dad loved Dal Tadka and so we always ended up ordering it. Actually the version that was made in my house everyday was super simple, with just a tadka of garlic and ghee on top of boiled dal. Dal Tadka on the other hand uses a lot of ingredients and spices, making it a special dish. So even thought the lentil was same, the overall taste was very different. This restaurant style Dal Tadka is my absolute favorite. I think I have inherited this from my dad, I really love dal tadka over any other dal. Sarvesh on the other hand, being a true punjabi loves his dal makhani! The literal translation of Dal Tadka is Dal=lentil and tadka=tempering. Tadka or chaunk (in hindi) is a term we often use in Indian cooking for the process of adding seasoning to a dish. It mostly involves adding spices like cumin seeds, mustard seeds, garlic, chilies, curry leaves etc. to hot oil or ghee. ✓ has a smokey flavor which makes it more amazing! Over the years, I have tried countless variations of dal tadka, both in India and then here in the US. Some people mix several types of lentils while other stick to only toor dal for the recipe. Some make a tadka of onion only, while others go heavy on spices. As with most Indian recipes, there no right or wrong method or way here. You make it in a way you like it. That’s always been my philosophy for cooking. 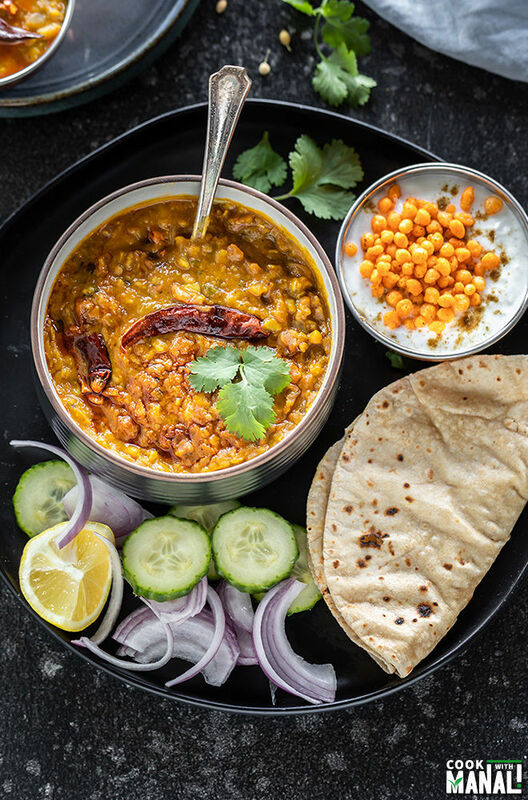 After a lot of attempts, I have finally zeroed on my favorite version of dal tadka and I am really excited to be sharing this one with you guys. 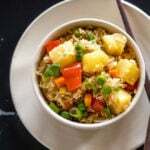 use fresh ingredients- yeah you always want to reach out for that store bough ginger-garlic paste but trust me, pound some fresh ginger and garlic in your mortar and pestle for this recipe and see the difference. 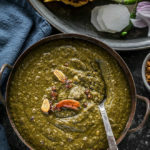 use ghee for cooking- if you are vegan then I understand that you would use oil for this recipe but if you are not vegan, please do use ghee for cooking the masala for the dal and also for the tempering. Ghee really imparts so much flavor to the dal. 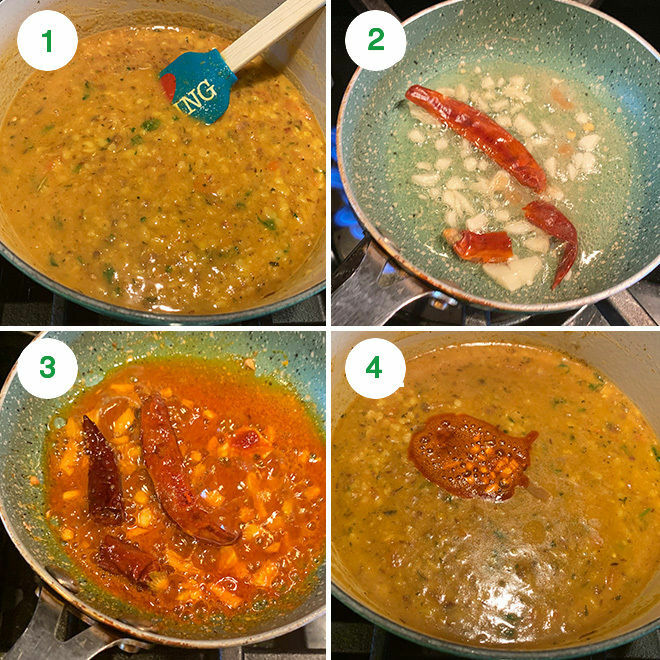 infuse smokey flavor to the dal through dhungar method- this is the real deal you guys! 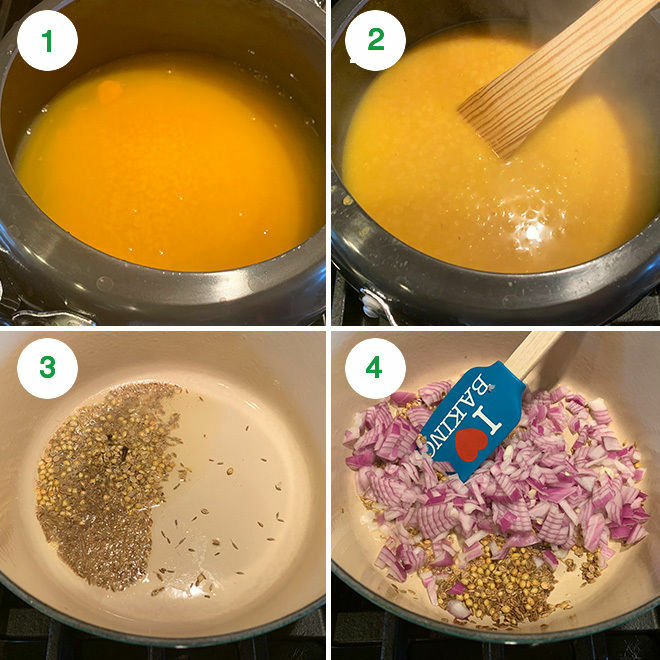 It just takes a simple dal from good to WOW! Seriously, I didn’t use to do it before but now I am hooked. What is dhungar method you might ask? It’s the technique of infusing the flavors of burnt charcoal (smokey flavor) into a dish. Piece of charcoal is heated on direct fire and then placed in a bowl which in then placed inside the dish. Then ghee or oil is poured over the hot charcoal, as the fumes begin to rise from the charcoal, it’s all enclosed with a lid. The dish adsorbs the smokey flavor in that enclosed environment. The longer you close the lid for, the smokier the dish will become so remember to not over-do it. I never go beyond 15 minutes. You can use the same method to impart smokey flavor to several other dishes like kadai paneer, panner tikka etc. 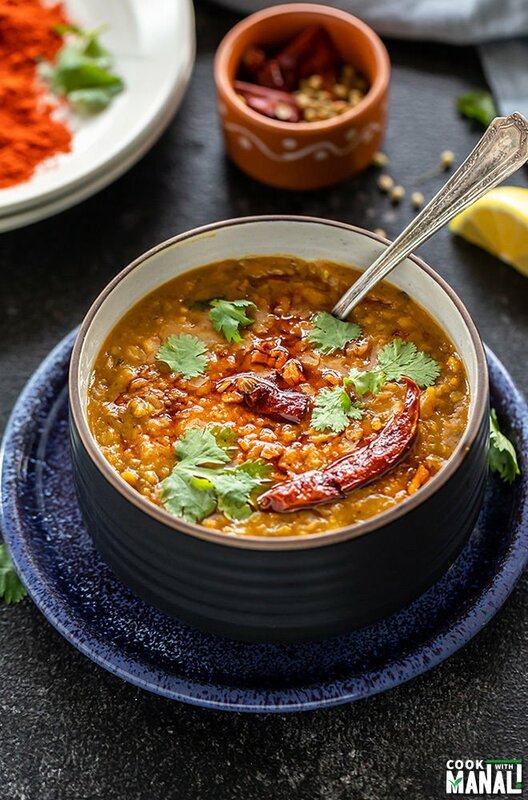 I hope you guys enjoy this dal tadka recipe, we sure did! Serve it with jeera rice for a perfect meal. 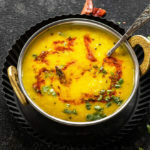 1- To a pressure cooker add toor dal along with turmeric, 1 teaspoon salt and 3 cups water. 2- Pressure cook for 4 whistle on high heat then lower the heat and let it cook for 3 to 4 minutes. Let the pressure release naturally. If using an Instant Pot, cook on high pressure for 8 minutes with natural pressure release. Set it aside. Meanwhile crush 4 large garlic cloves, 1-inch ginger and green chili in a mortar pestle and set it aside. 3- In a heavy bottom pan, heat ghee on medium heat. Once hot, add the cumin seeds, crushed coriander seeds and cloves. Saute few seconds until fragrant. 4- Then add onions, cook for around 3 to 4 minutes until they are soft and start changing color. 5- Add the crushed garlic-ginger-green chili. Cook for 1 to 2 minutes until raw smell goes away. 6- Add the chopped tomatoes along with 1/2 teaspoon salt and mix. Cover and cook for 7 to 8 minutes until tomatoes are very soft and cooked. 7- Then add the coriander powder, garam masala, kashmiri red chili powder, red chili powder, cilantro and kasuri methi. Stir the spices with the masala for few 30 seconds. 8- Add the boiled dal to the pan and mix. I also added 1/2 cup water here as dal looked very thick to me. 9- Let the dal simmer for 3 to 4 minutes. 10- For the tempering, heat 2 teaspoons ghee in a small pan. Once the ghee is hot, add 2 chopped garlic cloves. Also add hing and dried red chilies. 11- Cook for one minute until the garlic starts changing color. Add kashmiri red chili powder remove pan from heat. 12- Pour tempering over dal and mix. This last step is optional but recommended. 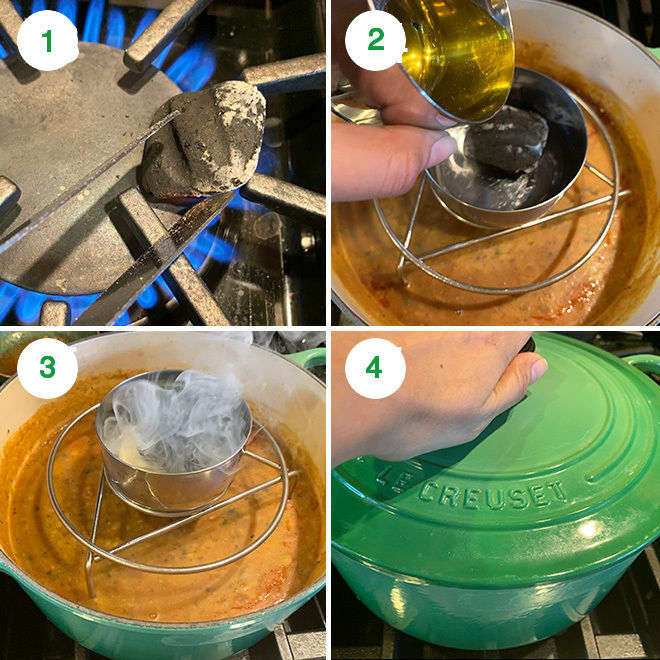 13- For the dhungar method – place a steel bowl on top of a trivet placed inside the dal. Then heat a piece of charcoal over direct heat until its red hot. 14- Place hot charcoal in that steel bowl on top of the trivet. Pour melted ghee (around 1 tablespoon) on top of charcoal. 15- You will immediately see fumes coming out of charcoal. 16- Immediately close the pan with a lid. Let it remain like this for 15 minutes. After 15 minutes, remove lid and remove the bowl from dal. The longer you keep the lid closed, the smokier dal will get, so don’t do more than 10 to 15 minutes. 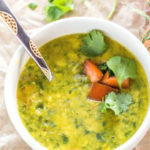 Garnish dal tadka with more cilantro and serve! 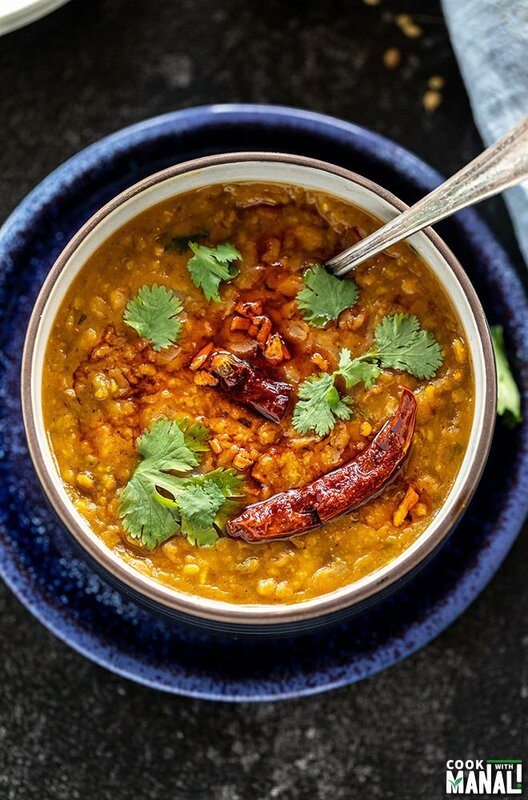 If you’ve tried this Dal Tadka Recipe then don’t forget to rate the recipe! You can also follow me on Facebook and Instagram to see what’s latest in my kitchen! 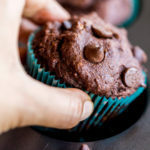 This post has been updated from the recipe archives, first published in 2014. Restaurant style Dal Tadka (lentils) tempered with ghee and spices! 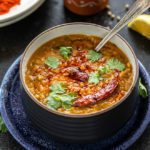 This dal has a smokey flavor which makes it all the more special! To a pressure cooker add toor dal along with turmeric, 1 teaspoon salt and 3 cups water. Pressure cook for 4 whistle on high heat then lower the heat and let it cook for 3 to 4 minutes. Let the pressure release naturally. If using an Instant Pot, cook on high pressure for 8 minutes with natural pressure release. Set it aside. In a heavy bottom pan, heat ghee on medium heat. Once hot, add the cumin seeds, crushed coriander seeds and cloves. Saute for few seconds until fragrant. Then add onions, cook for around 3 to 4 minutes until they are soft and start changing color. Add the crushed garlic-ginger-green chili. Cook for 1 to 2 minutes until the raw smell goes away. Add the chopped tomatoes along with 1/2 teaspoon salt and mix. Cover and cook for 7 to 8 minutes until tomatoes are very soft and cooked. Then add the coriander powder, garam masala, kashmiri red chili powder, red chili powder, cilantro and kasuri methi. Stir the spices with the masala for few 30 seconds. Add the boiled dal to the pan and mix. I also added 1/2 cup water here as dal looked very thick to me. Let the dal simmer for 3 to 4 minutes. For the tempering/tadka, heat 2 teaspoons ghee in a small pan. Once the ghee is hot, add 2 chopped garlic cloves. Also add hing and dried red chilies. Cook for one minute until the garlic starts changing color. Add kashmiri red chili powder remove pan from heat. Pour tempering over the dal and mix. For the dhungar method - place a steel bowl on top of a trivet placed inside the dal. Then heat a piece of charcoal over direct heat until its red hot. Place hot charcoal in that steel bowl on top of the trivet. Pour melted ghee (around 1 tablespoon) on top of charcoal. You will immediately see fumes coming out of charcoal. Immediately close the pan with a lid. Let it remain like this for 15 minutes. After 15 minutes, remove lid and remove the bowl from dal. The longer you keep the lid closed, the smokier dal will get, so don't do more than 10 to 15 minutes. 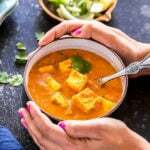 Use oil in place of ghee to make this vegan. Skip hing (asafoetida) to make this gluten-free or use gluten-free hing. 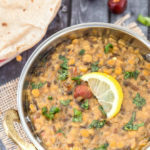 You may use a combination of lentils to make dal tadka. Commonly used- toor dal + moong dal or toor dal + masoor dal (red lentils). 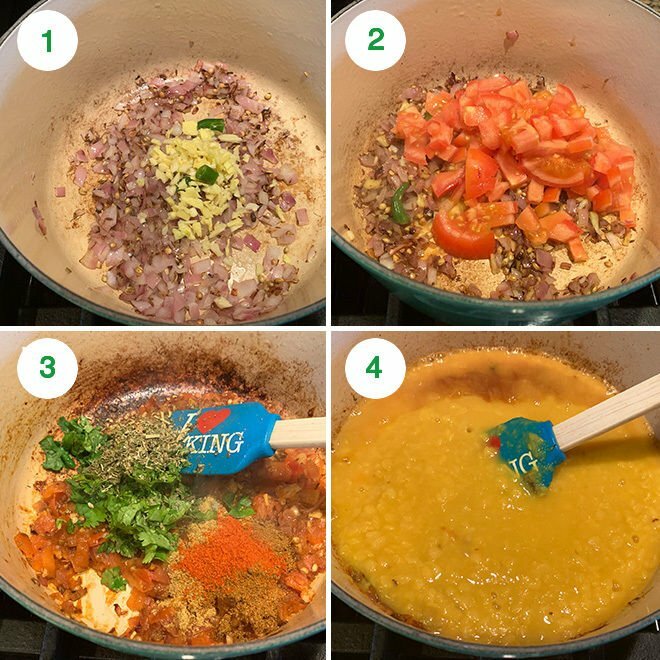 Yummy dhal recipe. Let me try dear!, the dhal NI way! Let me know how it turns out CV! 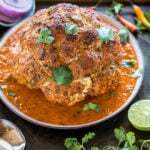 Thanks for sharing this recipe Manali, it was so good, better than restaurants. Dhungar method really makes all the difference. 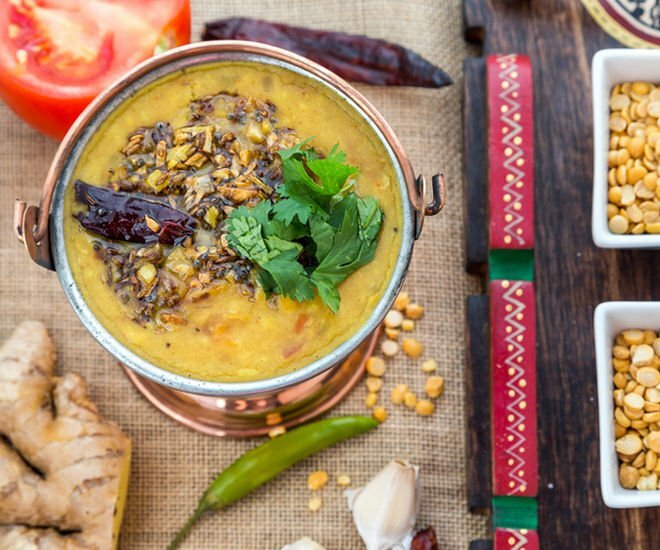 This is an interesting take on our traditional Dal Tadka. Loved the addition of Dhungar method! Thanks! Smokey flavor is awesome! yammi, look like very testy. It was awesome- yummy dal!